For over 30 years, Burley and the Burley bike trailer has lead the bike trailer market by producing the famous bike trailer, as well as a variety of child bike trailers. Recently, the company launched a new commuter trailer that was officially presented at the 2010 EuroBike tradeshow where it won a Gold award for quality, efficiency, and safety. Started in the 1970s by Alan Sholz and originally called “Burley Bike Bags”, Burley rapidly became the ultimate bicycle trailer manufacturer in the country. Several years later, it developed into a worker-owned cooperative and was eventually sold to an Oregon businessman who has continued to improve the design, durability and comfort of all Burley bicycle trailers. The Flatbed is designed for larger loads weighing over 100 pounds. It features a balanced point that effectively decreases torque and a hitch perfectly placed to give superior stability and tracking. 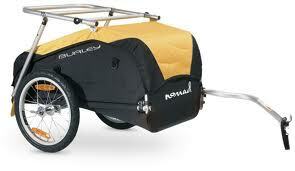 This bike trailer also has an open back and front that facilitates hauling big items & extended items. Adjustable tie-down straps help keep your load even more secure and safe from the roughness of off-road terrain. 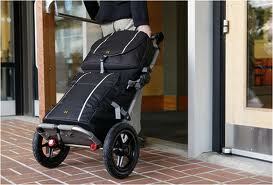 This is the revolutionary bike trailer that won an award at the 2010 EuroBike tradeshow. Famous for offering design innovations and the ability to transport nearly anything you wish (up to 60 pounds of stuff). The Travoy easily attaches to a bicycle's seatpost and allows for redistribution of the load's weight by riding at a 45-degree angle. To detach the Travoy, users just grab the hitch, twist and the trailer is instantly transformed into a lightweight (less than ten pounds) rolling cart. Burley also makes trailers for safe and easy pet transportation purposes. The Tail Wagon bike trailer is adjustable to allow space for small and large dogs and provides a “flip-down” tailgate to facilitate loading and removing pets. The floor is removable and quickly cleaned with water and soap. With the Tail Wagon, users also receive a trailer cover, safety flag, mesh side windows conducive to air flow and pockets to hold pet accessories. Animals weighing up to 75 pounds can be transported in the Tail Wagon. If you plan on using a bicycle as a bug-out vehicle, hitching a Burley bike trailer to your bicycle can give you the ability to haul a large amount of survival items in the event you have to flee a large-scale disaster area, and either don’t have fuel or your motor vehicle won’t run.